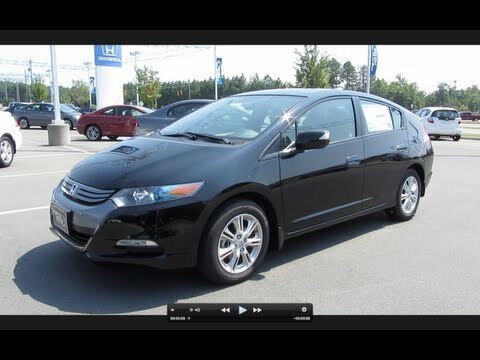 With an EPA rating of 40 city/43 highway the 2011 Insight fails to join the 50 miles per gallon ranks, but its real-world utility - in combination with a well-equipped base price of under $20,000 - should prove compelling to the existing Honda enthusiast. In short, if you like Hondas you'll like the Insight. I love my Insight! No problems so far and 95000 plus miles on it. It's a hybrid and gets 47 highway mpg and 30 mpg in town. The only things I have had to replace on it are tires, rear brakes, and windshield wipers. It takes regular gas and and only requires an oil change every 9000 miles. It has cruise control, power windows and anti- lock brakes. If you really want the best gas mileage stick to the speed limit, learn to coast rather than break, and accelerate as slowly as safely possible. My insight gets very good gas mileage when tamely driven. It has nearly 250,000 miles on It's original battery,transmissions,engine, etc. Honda's run well, and run long. One dislike is that the driver's view is a little more obstructed by a-pillars than the average car. Great gas mileage, reliable and stylish hybrid hatchback, for good price. Highly reliable vehicle for a good price! Amazing gas mileage, and has only cost me maximum 22 dollars to fill a tank. Good speakers and base system. New transmission fluid will make your acceleration way better. Stylish outside for a hatchback hybrid as well.